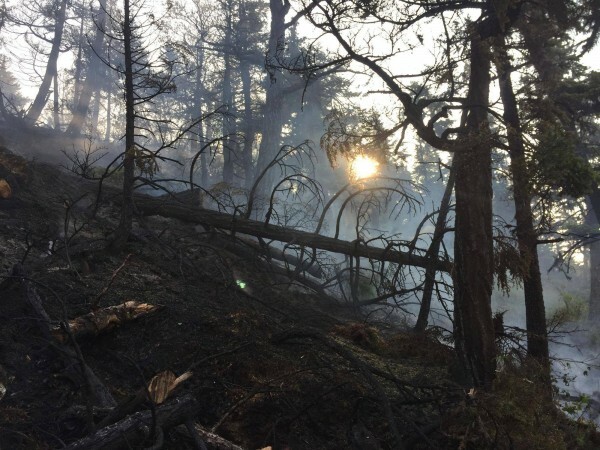 More than 300 wildfires are burning across Alaska right now- mostly in a wide swath of the interior and Southwest part of the state. More than 3 million acres of the state have burned so far this summer, which is on pace to beat the record setting 2004 season. Tim Mowry is a fire information spokesperson with the State Division of Forestry. He says several fires that were quieting down roared to life again yesterday (Monday) as temperatures reached into the 90s. The photo shows a burned area in the Stetson Creek Fire in the Chugach National Forest near Cooper Landing on the Kenai Peninsula, which is now 100 percent contained. Photo: Alaska Division of Forestry.